Are you searching for “How To Make Google Default Search Engine In Google Chrome” keyword in an unknown search engine? When it comes to search a term in online, we all rely on Google first. Google search engine makes it standards very height provide better search results in any keyword. Google is very accurate and efficient in providing suitable and relevant search results. They use a perfect algorithm to filter the highly relevant and content-rich results to a user. After Google, so many started building and creating search engines every day. We see some newly created search engines daily; mostly they come as a package along with free software installation on our PC. These free software installs the sponsored search engines packages to our browsers. Results, we experience a new search engine on our browsers. But we can change the default search engine again to Google in simple steps. This guide will help you to make Google default search engine in Google Chrome. In Google Chrome changing default search engine to Google is easy. Follow the below steps to make Google Search Engine as default one. First, click on Google Chrome “Menu” on the top right corner of the browsing window. Next head over to “Settings” on the available options. 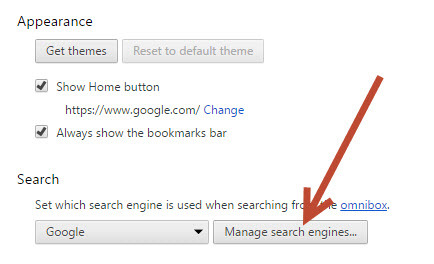 In Settings click on Manage Search Engines. Or simply you can click on Google in the drop-down menu in Step 3. 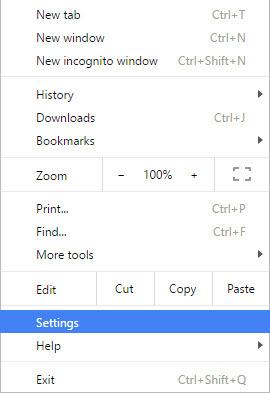 If Chrome is unable to show the Google in drop down simply follow step 4.